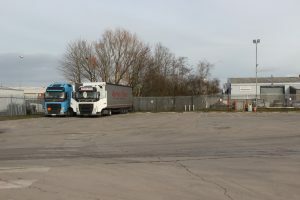 Skelmersdale in Lancashire is a midway point between Wigan and Merseyside and is a busy place for industry, so that means is also a busy place for road haulage; its vast industrial estates mean there’s plenty of trucks passing through, stopping to load or tip. Hence having a good truckstop in the area is a great plus for drivers. Skelmersdale Truck Stop describes itself as a “small independent family run truck stop that’s starting to gain quite the reputation within the transport and haulage industry. TSN visited and we agree, it’s a nice establishment with good staff, decent food and a relaxing atmosphere. 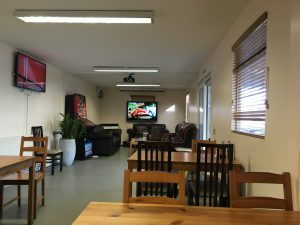 The café provides a good range of freshly cooked food. The Trucker’s Breakfast is excellent value at £4.70 and comprises two rashers of bacon, two sausages, egg, black pudding, baked beans, mushrooms and two slices of thick toast. If that is too much for you, then the small breakfast is £3.80 and is the same but without the black pudding and mushrooms. The ‘bin lid’ is also £3.80 and has the black pudding and mushrooms in place of the beans. Finally, there is the vegetarian breakfast at £4 which comprises scrambled egg, mushrooms, baked beans, tomatoes and toast. Toast is 50p and with jam or marmalade then it’s 60p. The STS offers a great range of food from light bites to full meals. Omelettes are £4.60 and come with bacon or mushrooms and cheese. 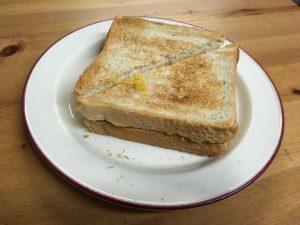 Toasties or barms are in the £2.70 to £3.50 range depending on fillings and include cheese, BLT, egg, bacon, sausage to multiple fillings such as bacon with either egg, sausage or cheese while the bacon, sausage & egg toastie is the ‘top of the range’ at £3.50. The choice of sandwiches is equally varied with cheese, ploughman’s, ham, turkey, roast chicken, tuna, chicken & bacon and Piri Piri chicken all available as fillings. Baguettes or wraps area also available with the same fillings and are about 50p more. Pasta and salads are also available with cheese or chicken mayo the cheapest at £3.10 and the southern fried pasta box with chilli sauce the most expensive at just £3.70. But you can also have ham, tuna, chicken & bacon, Cajun chicken and Piri Piri chicken also options. There is a specials board – please ask the staff for details, although on the day TSN visited, they had sold out – perhaps a good sign of the quality, and in fairness it was in the afternoon, after most of the lunch rush had finished. The main meals range is fairly brief, but includes chicken curry with rice, pie, chips, peas & gravy and fish, chips & mushy peas – all three meals are priced at £5.50. Jacket potatoes start at £3 for plain cheese, ham at £3.30, tuna at £4, chilli con carne at £5 and cheese & baked beans at £3.80. you can add a side salad & coleslaw for 70p. The desserts menus is also simple, with the choice of chocolate fudge cake, apple pie and apple & blackberry pie and all are priced at £4. Tea or coffee are both a pound each, bottled drinks are £1.30 while cans of pop are 80p as is Water. 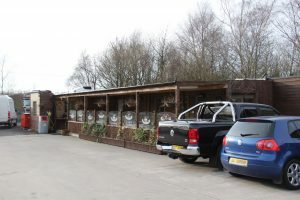 The site opens at 0600 and is open late into the day – of there are customers, then the staff will stay on to serve you. It can accommodate a good 50 trucks parking each evening. They are treated to 24-hour CCTV and security patrols. 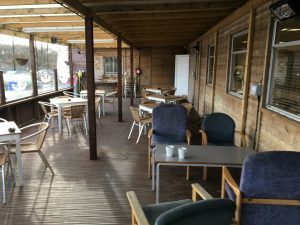 The site has clean showers and toilets, which the site says are available even if you are not parking, eating or paying for anything at the truckstop. Wi-Fi is free and is super fast fibre optic broadband. There is also a truck wash – this needs to be pre booked but the good news, is your truck can be washed while you are dining, so it will save you valuable time – especially while on a 45 minute legal break. The STS also offers a delivery service and meals can also be ordered for take away. Overall I was impressed with the STS, and not even nasty memories coming back of being based on Skelmersdale’s Pimbo industrial estate and having to endure my worst job ever in transport could dampen my enthusiasm for this place! 11 Paddock Road, Pimbo Ind.